LLS lovingly lets largest lively banner bring Bob’ O Connor brightness! 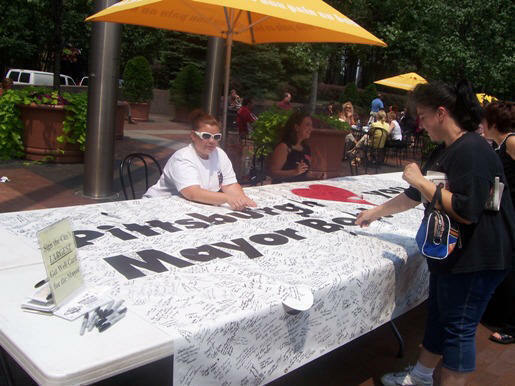 Pittsburghers came in flocks to sign the city’s largest “Best Wishes Card” for Mayor Bob O’ Connor from early morning hours to the late afternoon hours on Wed, July 26 in three different locations throughout Pittsburgh to show their support to the Mayor who was recently diagnosed with central nervous system lymphoma. Maureen Durkin, the Western Pennsylvania/ West Virginia LLS Chapter Campaign Director shared why Mayor O’ Connor means so much to them, their organization, and local blood cancer patients and survivors whom they serve. “He [Mayor O’Connor] has always been a tremendous supporter of our efforts and events. The Mayor has been present at the past two Light the Night Walks and had committed earlier this year to attend our October 5, Heinz Field Walk”, said Durkin. 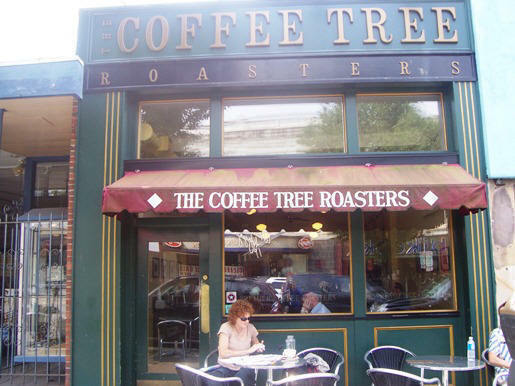 Mayor O’ Connor who was often seen at ‘The Coffee Tree’ in Squirrel Hill chatting with anyone who wanted to talk to him had left a vacant seat without his presence there during his treatment. Supporters of Mayor O’Connor were not going to let those passing by forget that. They were the first place to set up the first ‘Best Wishes Card’ for people to sign. Caliguiri was joined by two members of the DeBor family and Meghana Nene, an intern at LLS! Allie DeBor, a young Leukemia survivor and Susan DeBor, her mom gave their time as volunteers to show their support for the Mayor. Nene took time from her busy schedule as a marketing major at the University of Pittsburgh to ask those passing by to sign the card. As the card near the Coffee Tree was being spaced out slowly, the same situation was occurring at the PPG Plaza and US Steel Tower in Downtown. 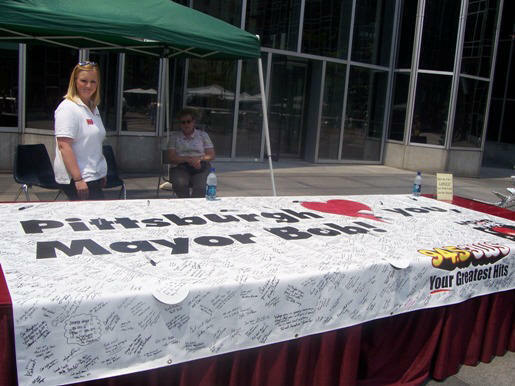 The rush hour at PPG and US Steel Tower brought hundreds to the signing table which made Kira Foley, the Campaign Manager for School and Youth at LLS really excited. “We had a really great turnout today from the City of Pittsburgh. Everybody came out to sign the card for Mayor O’ Connor! We got a great location going for us at the PPG Plaza”, said Foley. 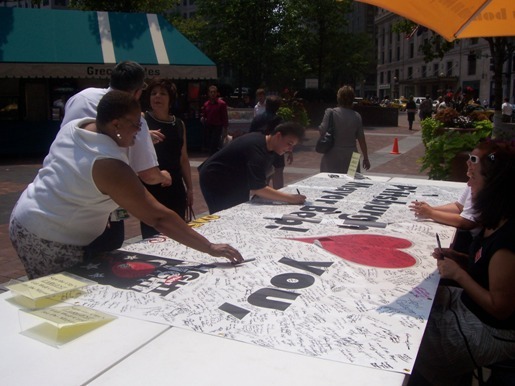 Supporters come and sign messages at the U.S Steel Tower! Couple of blocks away the signing continued outside the U.S Steel Plaza. Tina Massaki, senior director at LLS and Erin Evans, special events designator at LLS were busy manning the final table for the final ‘Get Well Card’. They wanted to be there to give back to the Mayor for all his generosity and help. Left to Right: Erin Evans and Tina Massaki watch supporters sign! “We have been here since 7:00 O’ clock this morning. We are going to be here until 2:00 O’ clock. 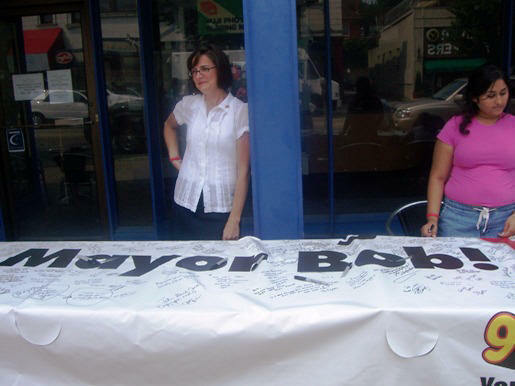 We are just trying to get signatures and well wishes for the mayor. We figured he is just a larger than life kind of guy. He has done so much for the city. We wanted to do something larger than life for him. We are trying to get as many people in the community to offer their wishes as possible. The next step is going to be to find a way to get him this banner”, said Massaki. More than thousand people had filled out the card at the U.S. Steel Plaza. Evans was very pleased with the crowds that took time from their schedule to stop by at the greeting card table to sign the card. “We had a great turnout today and everyone’s been so sweet and very helpful. [There are] a lot of great messages. We are so glad that people are so supportive of the society [LLS] and Mayor Bob. We wish him the best”, said Evans. According to the LLS press release, the Leukemia & Lymphoma Society, headquartered in White Plains, NY, with 66 chapters in the United States and Canada, is the world’s largest voluntary health organization dedicated to funding blood cancer research and providing education and patient services. All video and pictures taken by Ramesh C. Reddy!